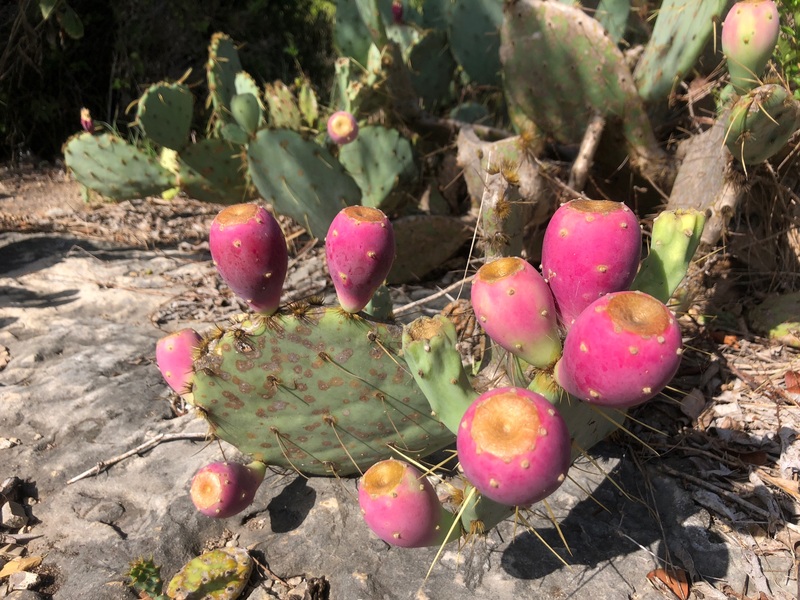 Before we left Texas, I’d harvested a bunch of the red fruit (tunas) of prickly pear cactus where we were camping. I’d made prickly pear juice quite a learning curve, with quite a few sticky (ouch!) issues. And I had another bag full of tunas thinking I’d do it again, using my new wisdom, and make thick syrup to give as gifts for swirls in Margaritas. Passing through Santa Fe, we were invited to return for Mad-Stock, a Woodstock themed celebration of music, peace and love. 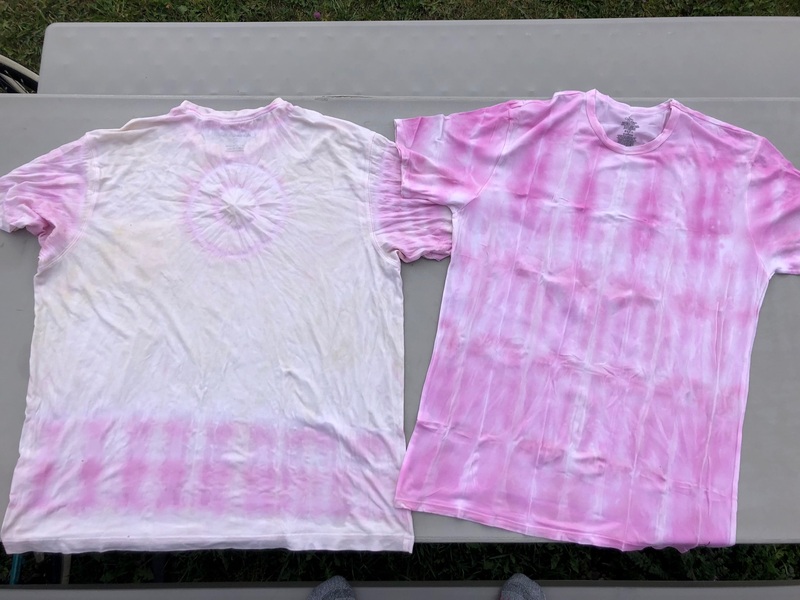 I decided I’d make tie-dye shirts for the guys our of the prickly pear juice! Both said they didn’t mind wearing hot pink… what a washout!!! After all my work; cooking them in the hot juice for an hour, then letting them sit overnight in plastic bags, when I untied them they were gorgeous. When I washed them, this color faded completely away. Now, you know full well that if I spilled any on a good white blouse, it never would have come out! 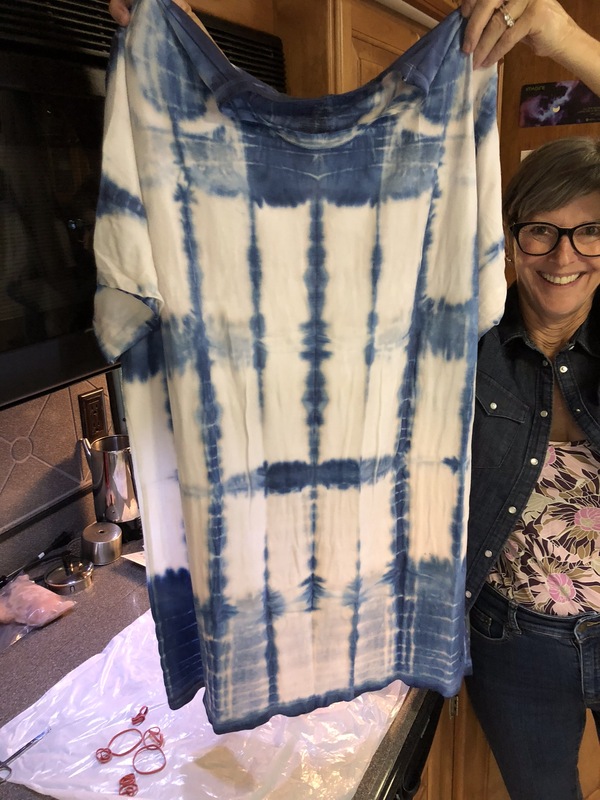 I was even more determined now, and after looking through Pinterest, I decided to try again, this time using an old friend from the 70’s… RIT dye in a lovely Indigo Blue. I used some of my old tying techniques (I used to love doing tie-dyes in pretty patterns, but simple, beautiful colors) incorporating tying stones into the folds, simple pleat-and-band, and Japanese Shibori folding and resistance techniques. 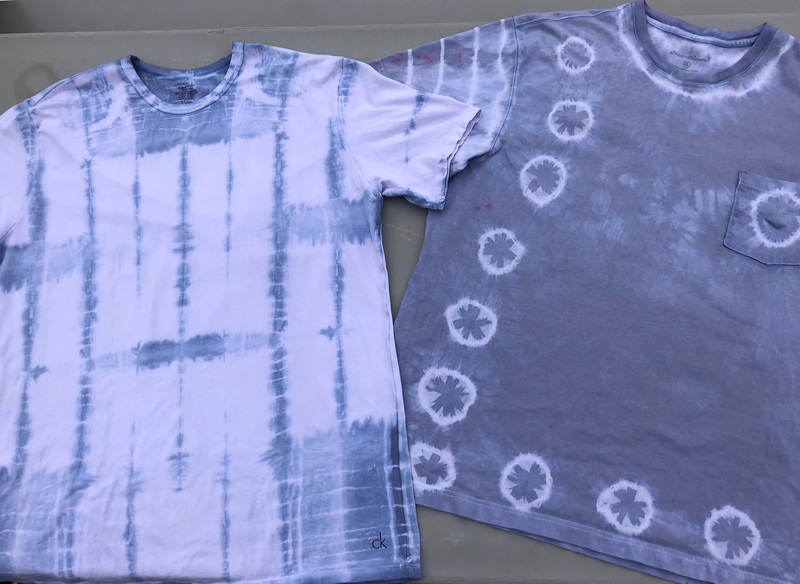 I followed RIT’s instructions TO THE LETTER, and when I pulled them from the dye bath (done in a 3-gallon bucket in my kitchen sink) I was over-the-Moon thrilled! Indigo blue! Shibori folds! Gorgeous circles with marigold-like patterns within! Turns out the failure was in RIT’s isstructions, for when I looked online there were completely different guidelines than on the box. Had i known, I would have gladly taken all the extra time they were proposing. I hoped the guys would still wear them. The next morning when I awoke, the first thing I saw on my FB feed was this post by a friend, Lynn – “Failure is an event, not a character flaw.” That changed my mind, what I did failed, but now I know where to pick-up next time. This was entirely too much fun, too relaxing, and too fulfilling to quit. I’m not ready to take orders yet, but I see a lot of Blue in my future! When n younger years doing lots of sewing crafts I learned in my 4-H sewing classes to wash n rinse in our old “utility “ sink . Key is the rinse n sit in white vinegar. Prior to cutting out the fabric this was key to the color fades and bleeding one color into another. It seemed to “set” the color. Luv the travel tips. I read about using both vinegar and salt, depending on the fabric. Will try again next year when the “tunas” are ripe since I love the pink, too!!!! Thank you for the confirmation that it can work! Thank you, dear Miss B!